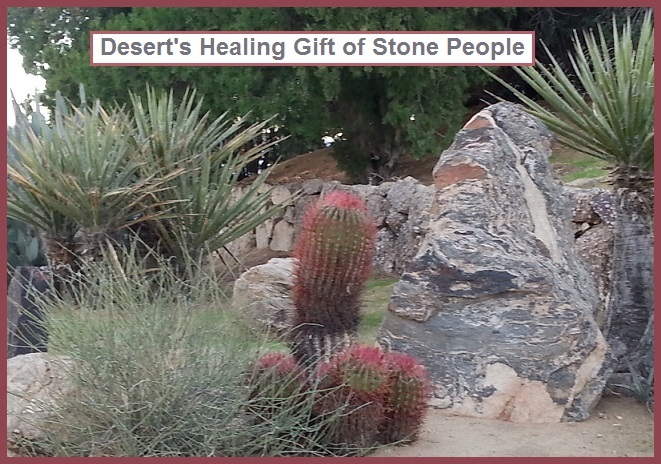 I just returned from receiving training on initiation of the Munay-Ki Nine Rites, held at Joshua Tree Retreat Center. I was delighted to be with 30 students from USA, Mexico, France, Netherlands and Germany. 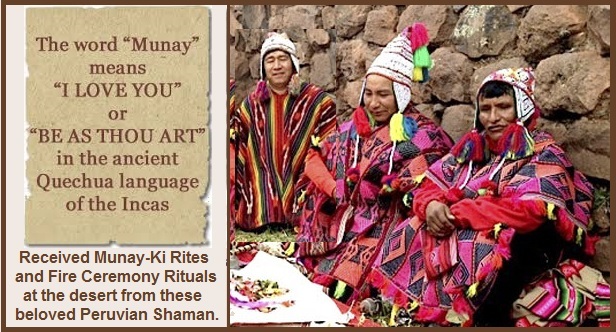 We received all the Nine Rites from two amazing Four Winds Society instructors, and also from the three beautiful Shaman/Medicine Men from Peru pictured below. I was prepared to be grateful for these instructions on Munay-ki but not for Nature’s Desert Gifts. 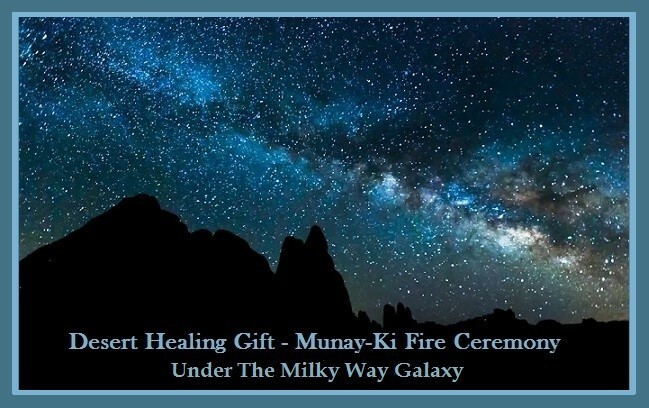 The healing started at sunrise and continued until covered by the most magnificent blanket of the Milky Way Galaxy every night. 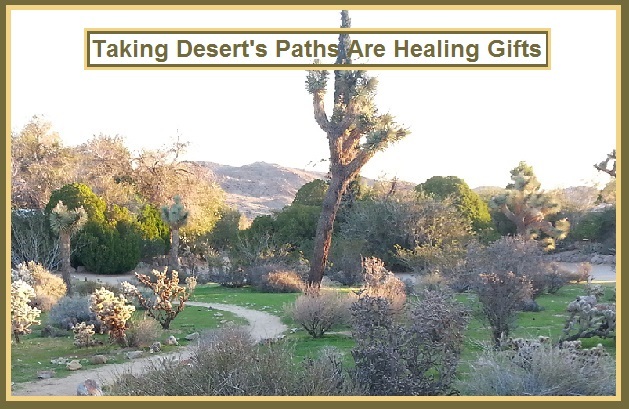 Each morning before class another path would take me to a desert healing gift. On one of my morning walks before class, I discovered a labyrinth. 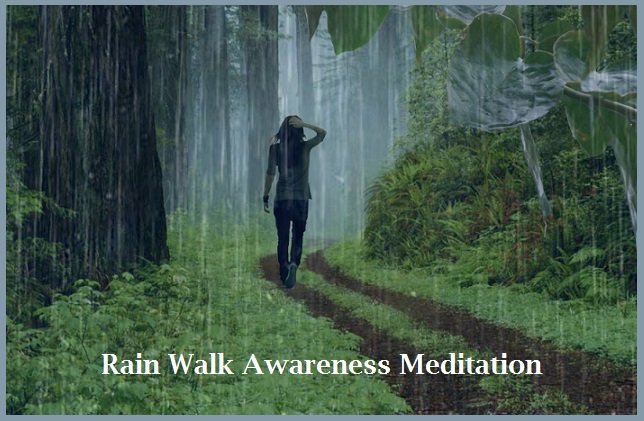 I found myself walking the spiral and being very much pulled to Mother Earth. I wasn’t disappointed when I looked up the following meaning: A labyrinth is an ancient symbol that relates to wholeness. It combines the imagery of the circle and the spiral into a meandering but purposeful path. 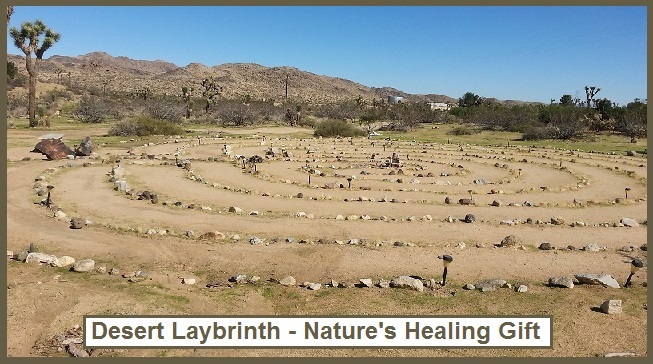 The Labyrinth represents a journey to our own center and back again out into the world. Labyrinths have long been used as meditation and prayer tools. Every morning I would see so much in the desert that reminded me of the following part of the Sacred Space Prayer dedicated to Mother Earth. “We are gathered for the healing of all your children, the stone people, the plant people. the four-legged, the two-legged, the creepy crawlers, the finned, the furred, and winged ones. All our relations.” I was quite sure all these relations were there to meet on the desert. Boasting some of the darkest nights in Southern California, Joshua Tree National Park offers many visitors the chance to admire the Milky Way Galaxy for the first time in their lives. I can totally attest to the magic of spending two nights of celebration under the stars. Even the picture doesn’t give it justice. It was like an out-of-body experience. 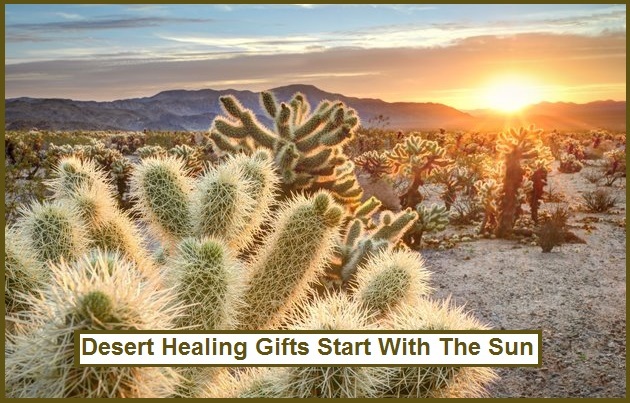 Thank you for letting me share the desert healing gifts I received during my stay at Joshua Tree Retreat Center. 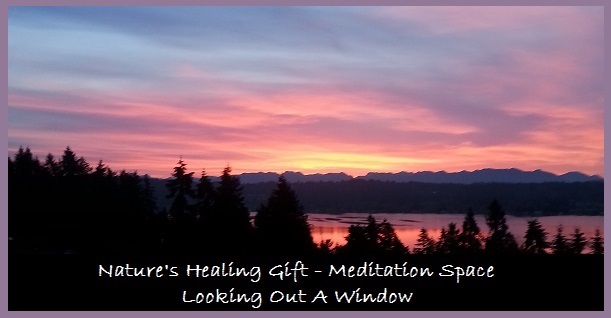 Sometimes we need to take advantage of nature’s healing photo opportunities that surround us 24/7. 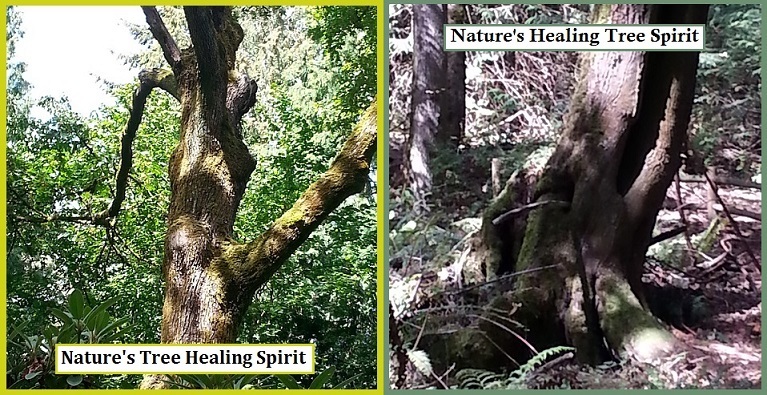 I decided to share these nature’s healing photos taken on my morning walks. 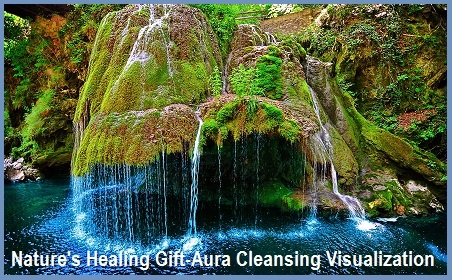 There is a great deal written on therapeutic photography. When we see something in nature that moves us to snap a picture with our camera, there is an intimate personal bond captured at that moment. Do you remember watching clouds as a kid and seeing shapes? I am an active cloud watcher. When was the last time you looked up to discover an animal, creature, or a caricature of a famous person floating in the sky? It is like magical healing to let your inner child come out and play. Cloud watching allows you to use your imagination and it gives you a chance to relax! 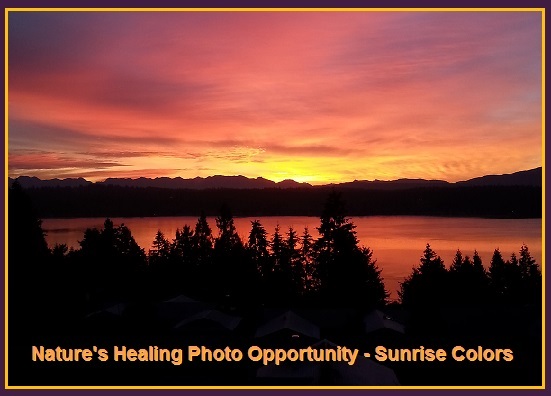 October is a wonderful month for photo healing opportunities. 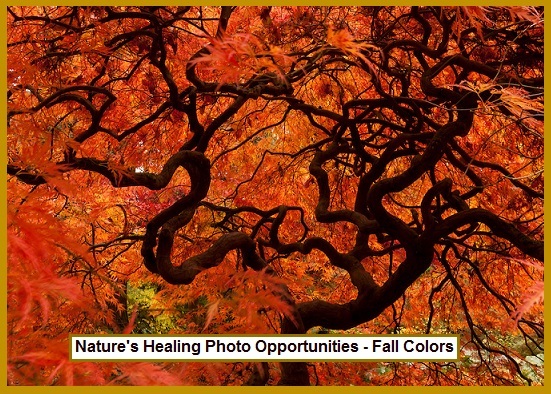 Hopefully we all can take the time to benefit from nature’s fall colors by visiting our local botanical gardens and parks. 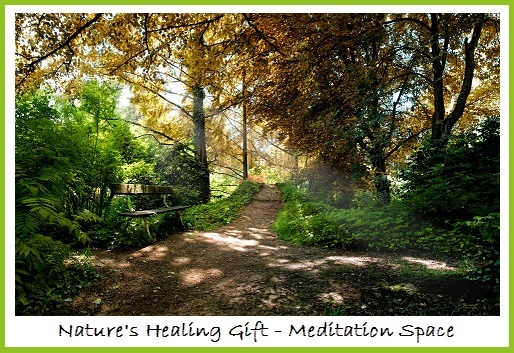 It is important to remember being in nature is healing, but also being surround by nature inspired art is also beneficial. There have been studies proving that using this type of art in hospitals and medical facilities help patients heal faster. I hope you are ready to grab your camera and head for nature. I have been extremely delighted with my latest early morning walks through the neighborhood. 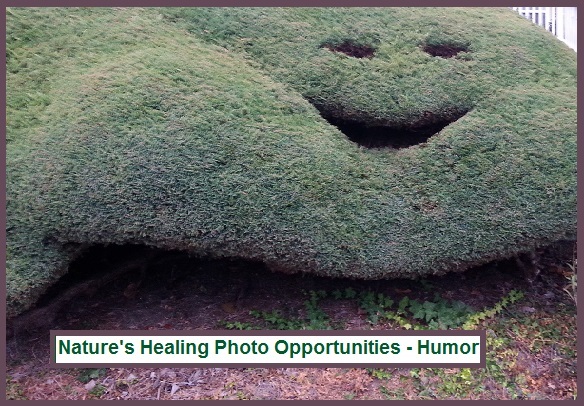 The phone camera came in handy when capturing the above photo where someone created Fall humor in nature for all to enjoy. Each morning when passing this gigantic hedge, it puts a smile on my face and a warm connection to a neighbor I haven’t met. Remember a smile is the key to unlock the door of healing love-energy, or also known as (SMILE = Start + My + Internal + Love + Engine). 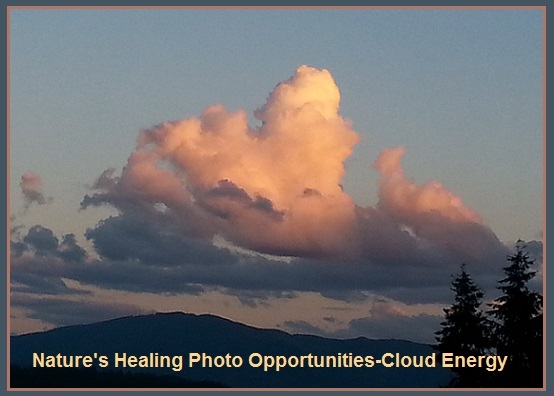 Nature has love-energy photo opportunities for everyone! I know every one that loves trees, like myself (a true tree hugger), can attest that each individual tree has its own energy. 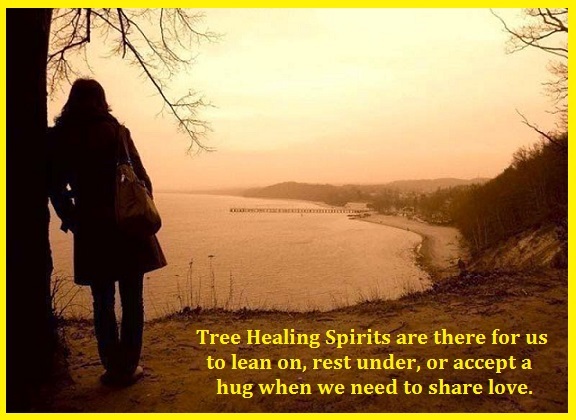 Trees also carries a spirit or a piece of energy from its species as a whole (like our DNA). For instance my favorite giant oak tree in the backyard of my previous home has its own unique energy, but it also carries with it the otherworldly qualities of every Oak Tree that’s ever existed. 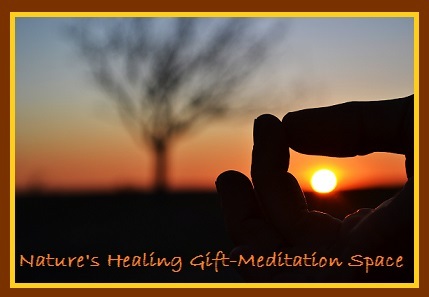 Native American teachings refer to trees as ”The Standing People.” These Native teachings speak of the special lessons and gifts trees give to humankind. The two trees featured above are among other (Standing People) trees I have seen in my city’s local botanical park. I invite you all to start looking for the personality of some of your favorite trees. Oak is one of the most loved trees in history. 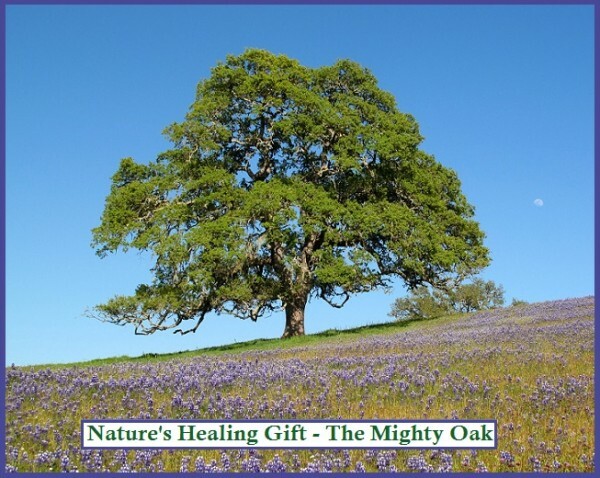 It has an energy that is strong, powerful, mostly masculine, deeply-rooted, and wise. Oak also represents steadfastness, stability, and carrying an acorn with you will bring protection. Willow is a favorite. She holds feminine energy, as well as being a representation of the moon and the goddess. 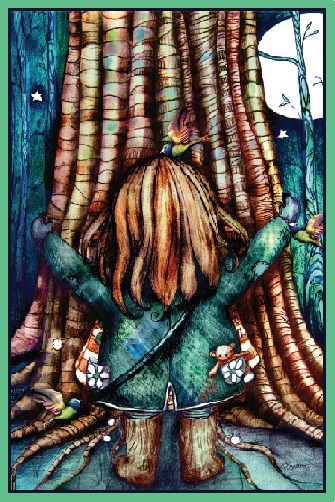 Willow will bring you dreams and help in enchantments among many other things. 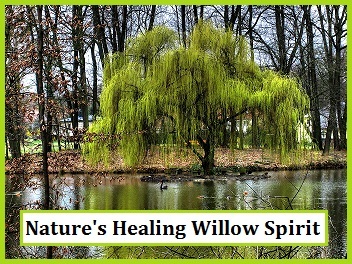 Visit a Willow if you are wanting to be open to clairvoyance and the powers of the third eye. Palm tropical tree is found in warmer climates. 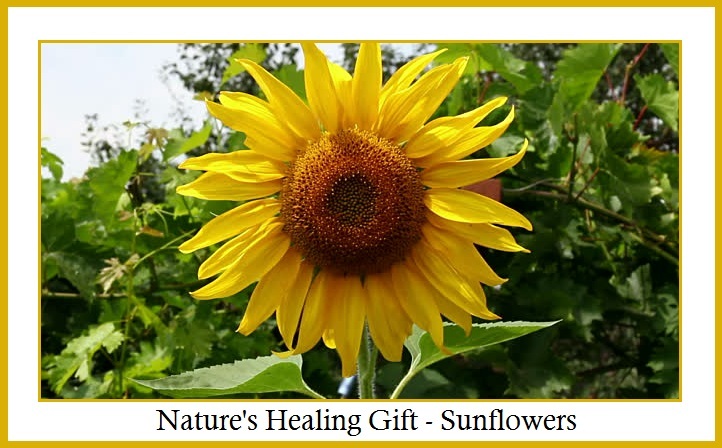 This magical tree totem will bring the sunshine into your life metaphorically speaking. In ancient Egypt, the palm tree was a phallic symbol representing the fertility of the gods, namely Osiris. 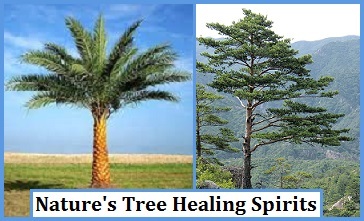 Pine tree has many spiritual properties which include fertility, abundance, health, purification, and rebirth. 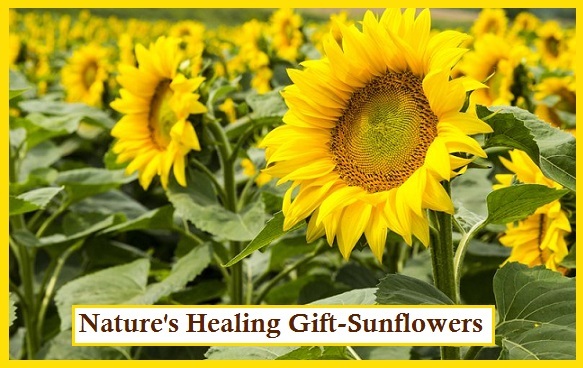 It is associated with ancient wisdom, impeccability and eternal life. 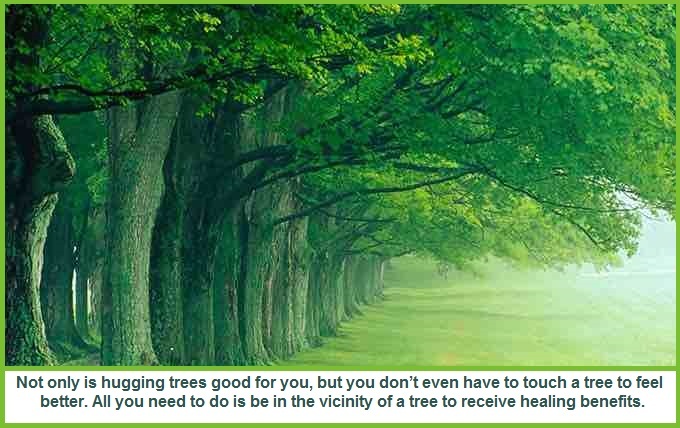 Keep in mind that any type of tree can be your totem or spirit guide and will vary depending on where you live. We will be reviewing more of the beautiful Tree Spirit Guides in the future. You might want to go out and hug a tree today. It is very healing. Sometimes restless nights can bring magic. The last couple of nights, I have gotten up after midnight to see a beautiful Half-Moon. Fortunately I was able to stretch out on the sofa and gaze at it’s magnificence and begin to feel this calming energy penetrate my whole being. From January 1 until the New Moon on January 9, we can work with the Waning Moon energy to banish unwanted situations, harmful relationships, associations, or break bad habits. 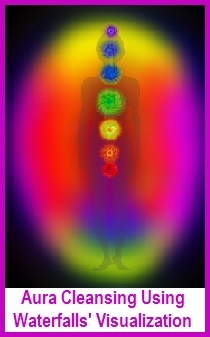 This is a good time to replace negative with positive and balance the energies within our body. 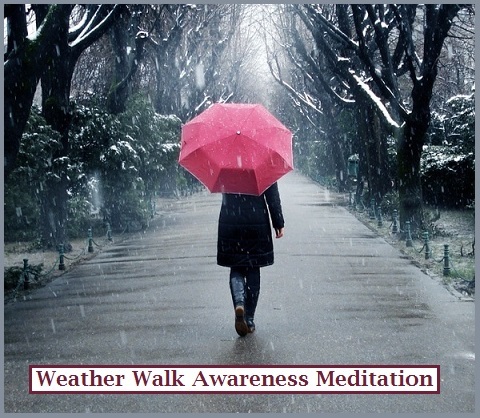 We can start with self-analysis, rest, meditation, and getting prepared for the energies of the New Moon. 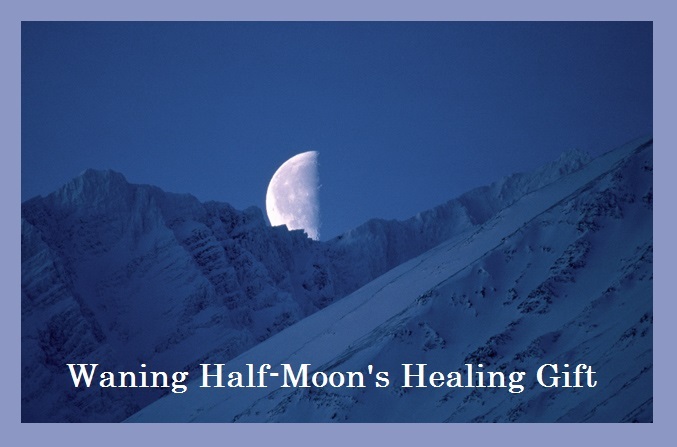 It is also significant to know that the Waning Moon phase brings a conscious process of creative release. 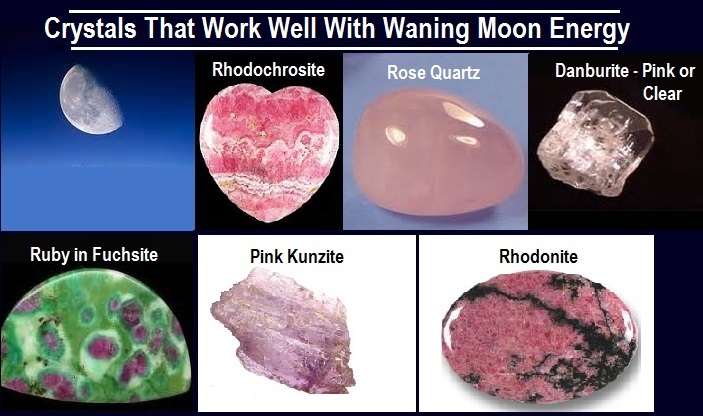 This is a wonderful time to include help from any crystals such as Rhodochrosite, Rose Quartz, Rhodonite, Ruby in Fuchsite, Pink Kunzite and/or Danburite. These Crystals carry an energy of unconditional love. They are a reminder that we need to care and love ourselves first so we are then healthy and whole in our relationships and in service to others. 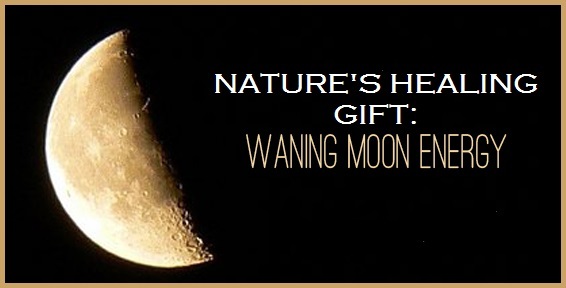 The Waning Moon is a beautiful reminder to Rest, Recoup, Recharge! 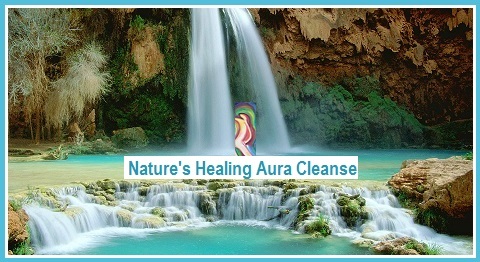 , healing, growth, blessings and prosperity. TREES seen on “The Goddess Pilgrimage to Crete with Carol P. Christ” (www.goddessariadne.org). 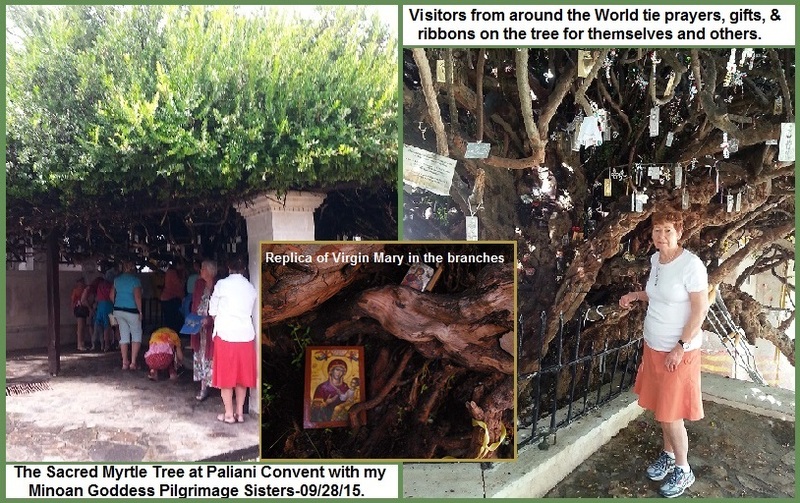 This introduction to Minoan culture included a visit to the Paliani Convent, an old convent (from about 668 BCE), and the Sacred Myrtle Tree that is said to be over 1000 years old. I have always loved the spirit of trees, and this one was magnificent. The story goes that after the Turkish invasion in 1821, the convent was destroyed, but an icon of the Virgin Mary was found in the tree. The nuns moved it into the church, but the next day it was found back in the tree. As many times as they tried to take it in, She made her way back to the Tree of Life. And so she has remained there, now entirely encompassed by the arms of the great tree (a smaller replica hangs on the branches for all to see). 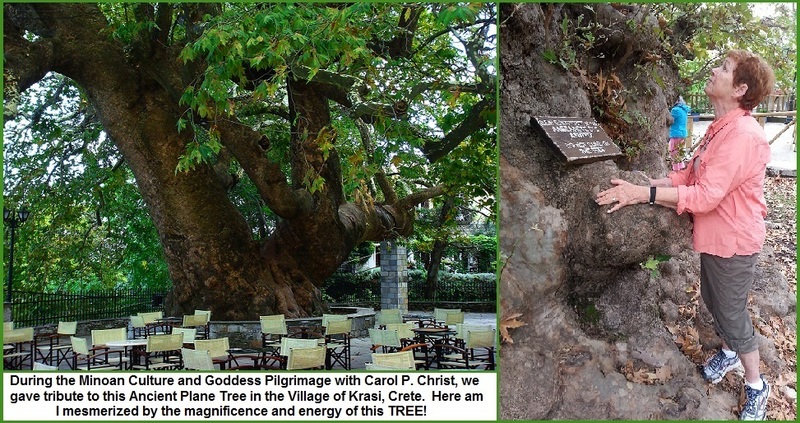 The small village of Krasi, Crete, has one of the oldest trees worldwide. Due to the free running water, the area is covered with walnut trees, plane trees and all kinds of vegetation. Next to the spring in the middle of the village is this beautiful estimated 2,000 year old Plane Tree in all its glory. The root has a circumference of 22 meters! We circled the tree and invited others to join us celebrating nature’s miracle. This enormous tree was a huge surprise. 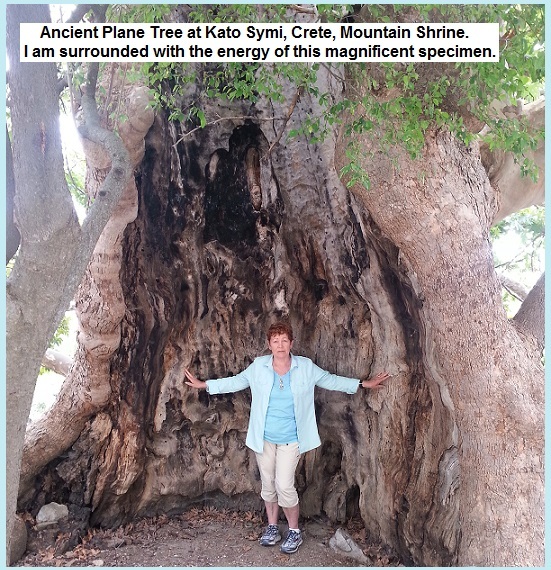 On one side it was another giant plane tree near the Kato Symi Mountain Shrine. I was immediately drawn to this tree but wasn’t able to spend time with it because we were here for a purpose. We were driven in pickups near the top of the mountain and allowed in through a locked gate to one of the sites we honored and performed a simple symbolic ritual such as pouring honey, wine, milk, or olive oil, as women did on the Minoan Goddess Alters. At this ritual we were also each reading a poem, written by Sappho, a female Greek lyric poet, born sometime between 630 and 612 BCE. It wasn’t until slipping back through the raggedy wire gate that I saw the opposite side of the tree I admired. Here was the gutted shell caused by fire, yet this tree continued to live and give life to new branches. Wrapped inside almost the womb of this giant tree, I felt the overwhelming importance of nature’s energy for my well-being. 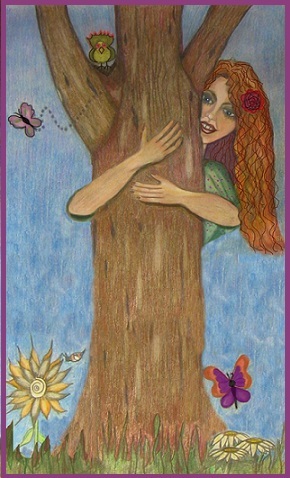 I LOVED HUGGING AND BEING HUGGED BY THE TREES ON CRETE!